Richard and Patricia Hewlings live in the Fens, the district known as the Holy land of England. Their house is a flat-fronted, red brick farmhouse with a pretty Georgian doorcase, and an older wing jettying out into what was once the farmyard at the rear. It’s known locally as ‘Big Old House.’ There’s a dairy and some barns at one corner, and a Quaker meeting house terraced onto the other, with its burial yard behind; the bones of some more honest Quakers lie under its floor. 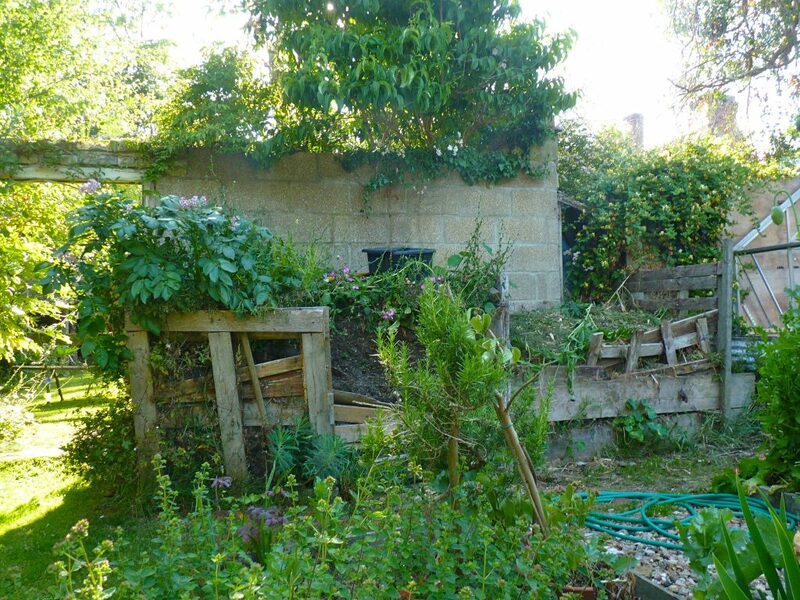 Richard (who is a former Inspector of Ancient Monuments, and works for English Heritage), discovered and then reburied them there, in the course of repairing these dilapidated and derelict buildings. Tricia has planted a rare and imaginative series of garden compartments and painstakingly restored old floorboards and interior paintwork. 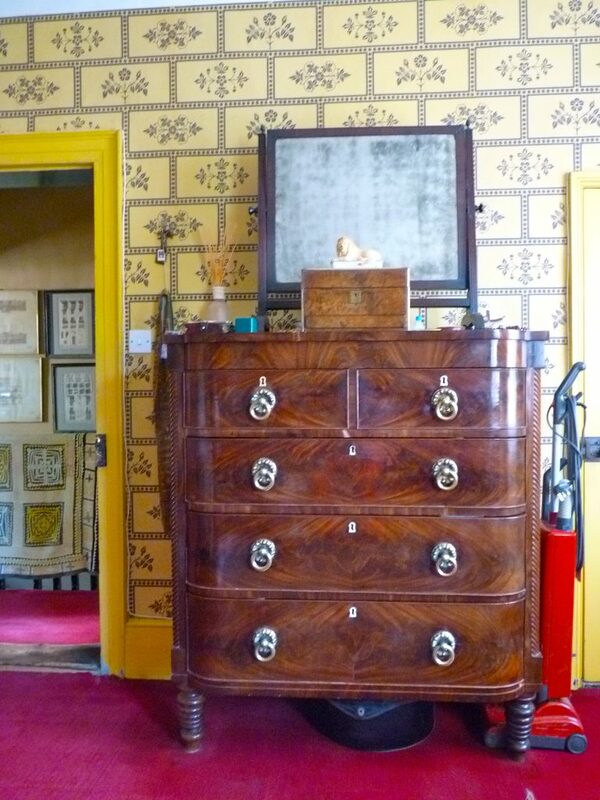 Richard has hauled back joinery and furniture, the by-product of a lifetime’s curiosity for old things and buildings. Here, in the 1980s and 90s, their six children grew up. When Richard and Tricia bought the Old House it was empty and derelict, divided into flats for the workers who ran a tractor-tyre retreading factory from its yards. 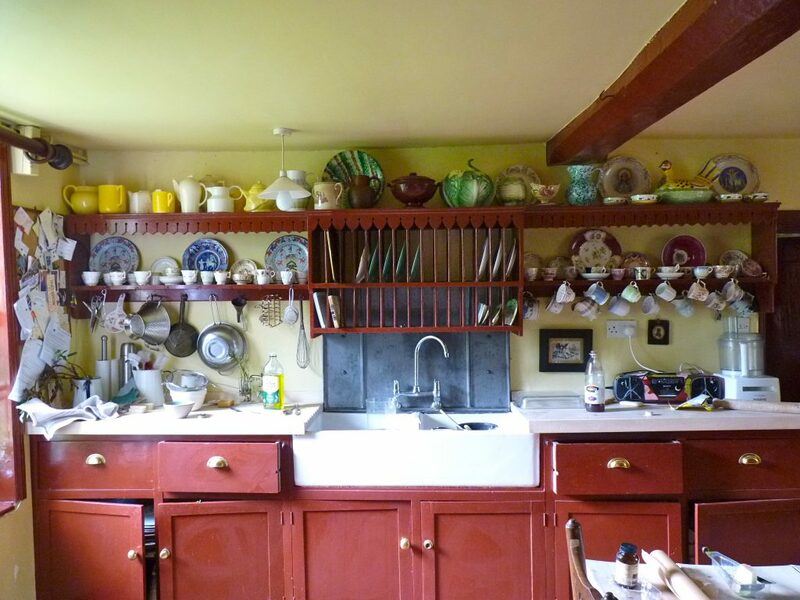 The house had been empty for six years and most of its chimney pieces and joinery had been stripped out. Now it is the portrait of a marriage, and a family. 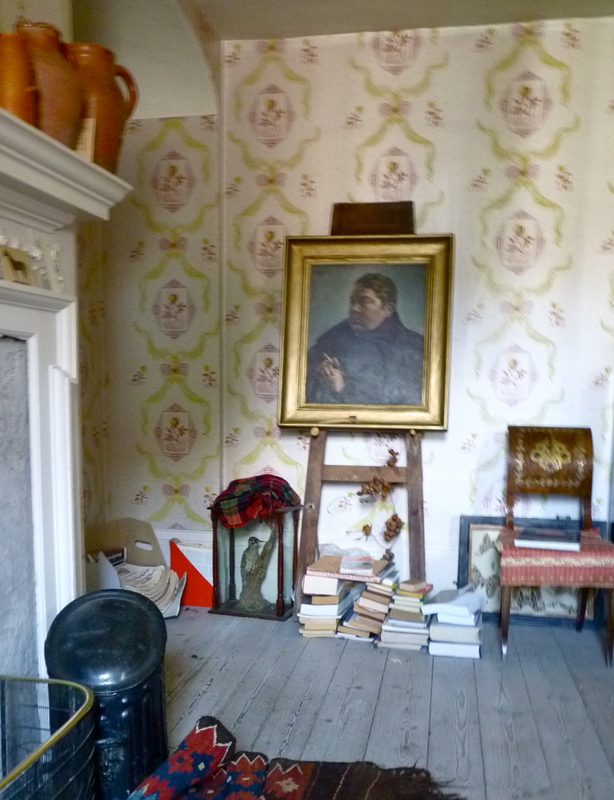 Here is the hall, with Easter palm crosses. 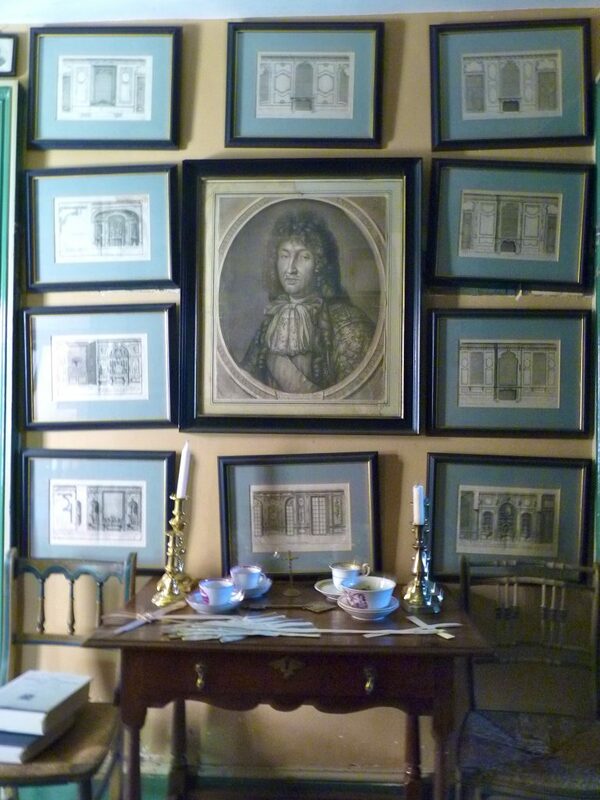 The staircase hall, hung with prints, edge to edge. 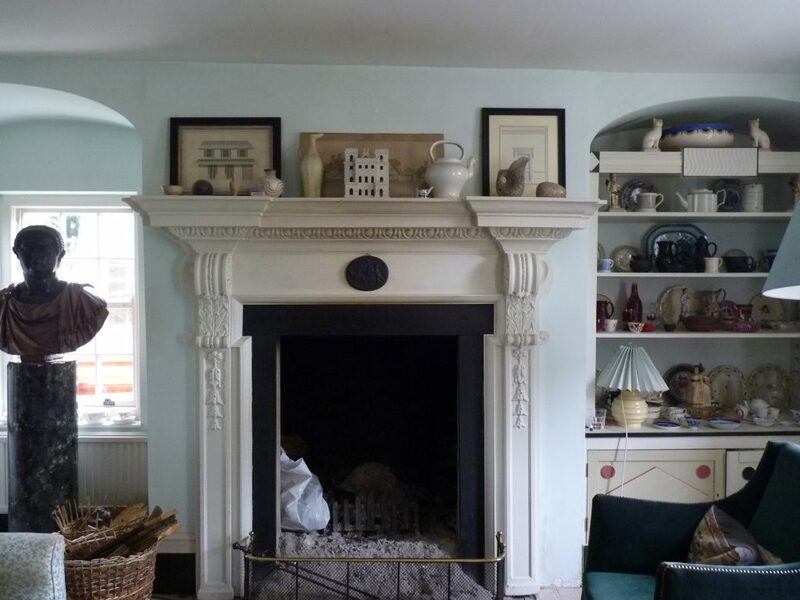 Richard designed this handsome, immodest fireplace, the largest in the house, around the two end pilasters that he found in a Bury St. Edmunds antique shop for £25. 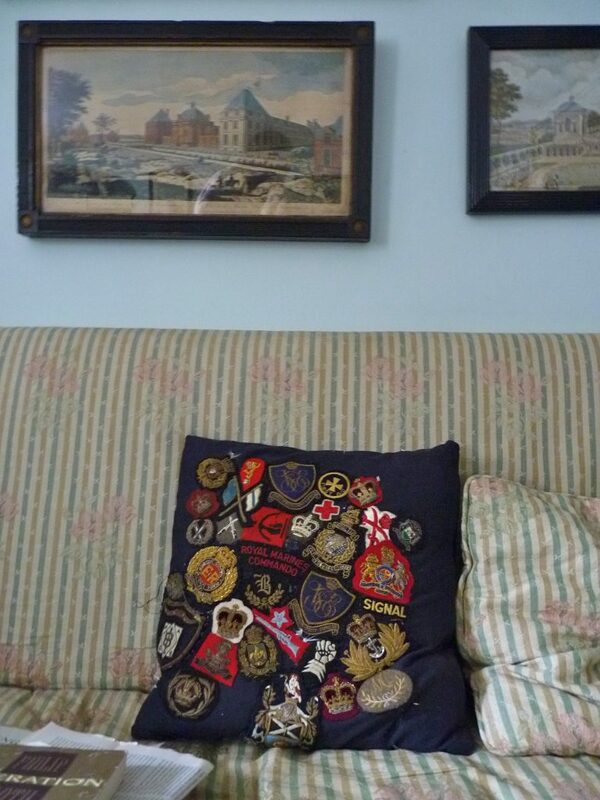 This cushion stitched with badges from military uniforms was made by their daughter. 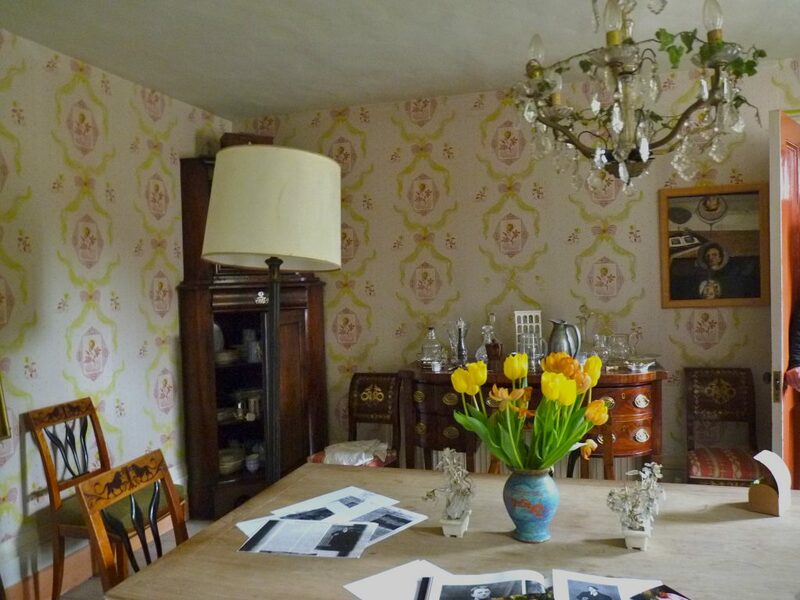 The dining chairs belonged to Oxford aesthete Dadie Rylands, a fellow of Kings College, Cambridge : Richard found them in a local country auction. 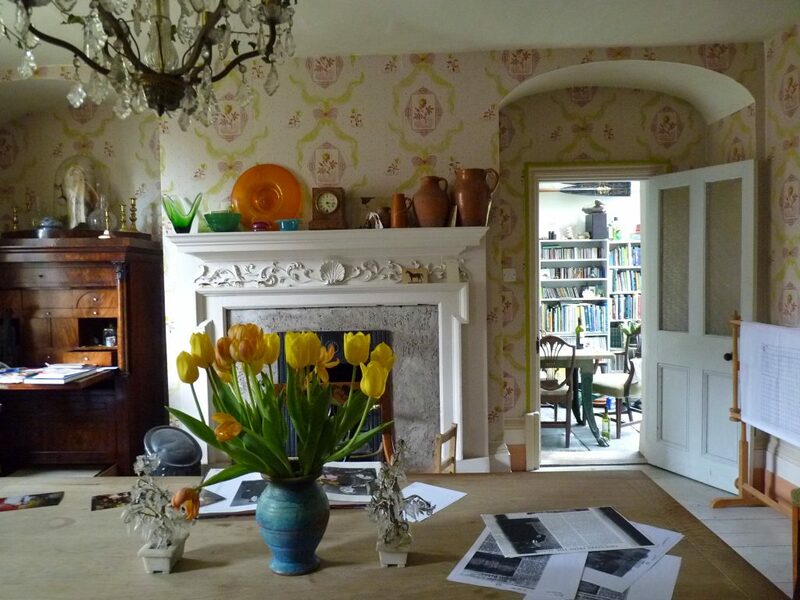 His college rooms were decorated by the Bloomsbury artist Dora Carrington, and immortalised by Virginia Wolf in A Room of One’s Own. 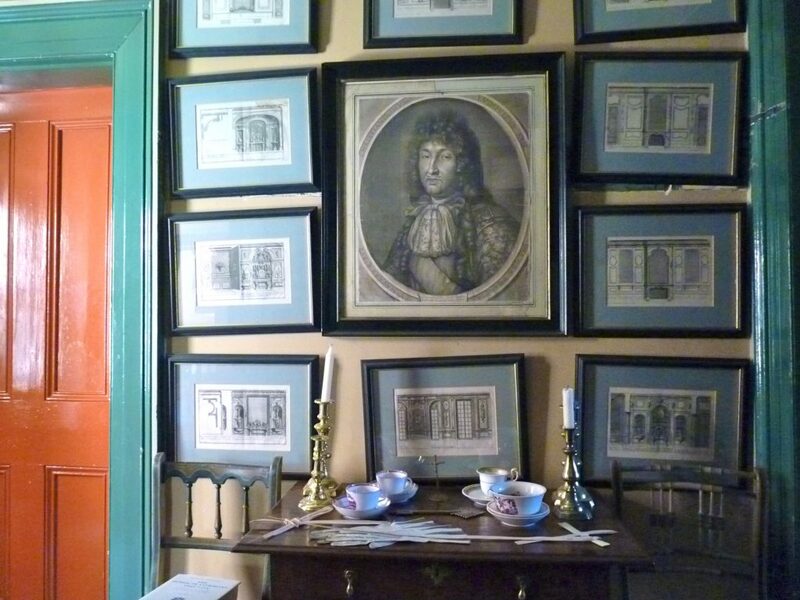 Propped on an easel is the finest portrait in the house of the powerfully built John Davenport, Tricia’s first father-in-law, writer, fund-raiser for Dylan Thomas, boxer, pianist and poet. 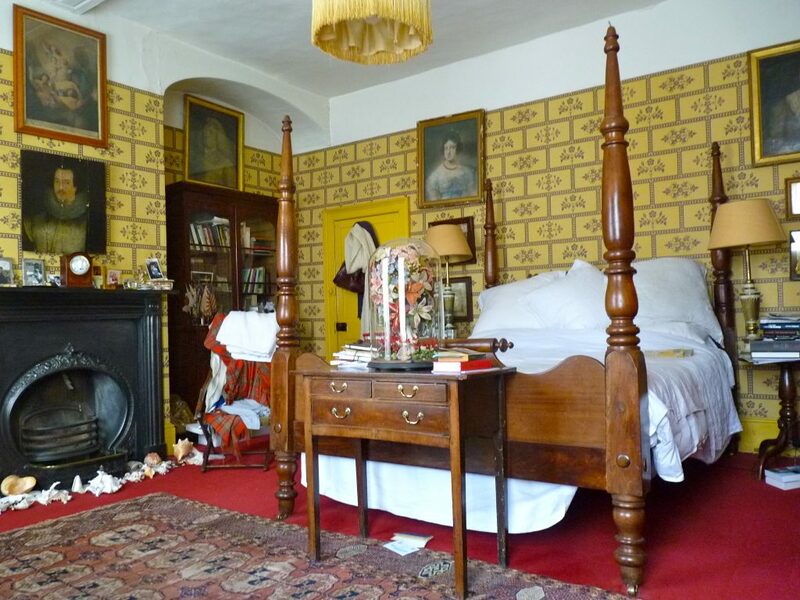 The wallpaper was deigned by Edward Bawden in 1935, and supplied by Coles of London. 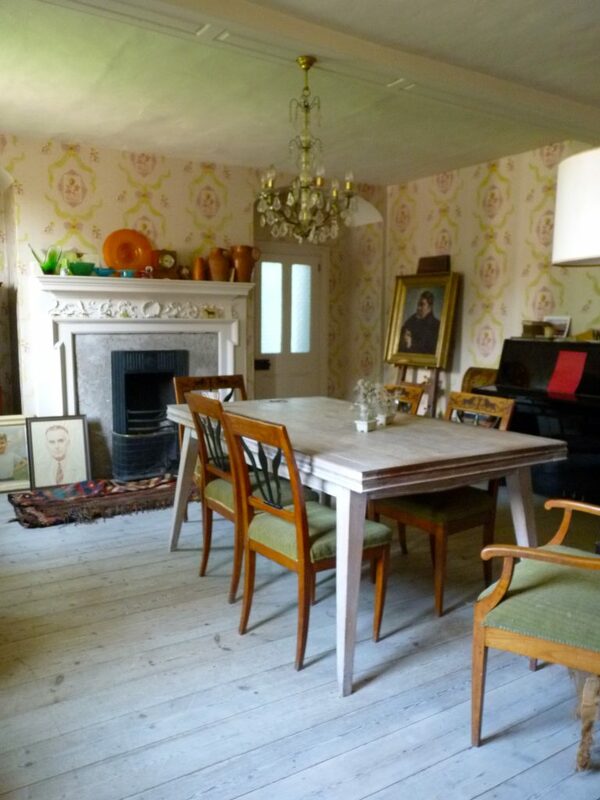 The floors were exactingly hand sanded by Tricia and bleached with lye. 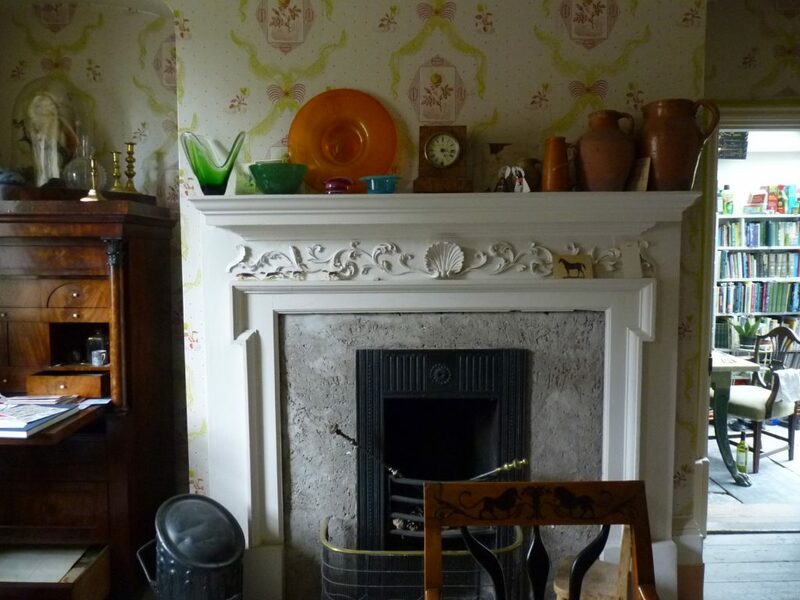 The chimneypiece was created from salvage, bought at a local country house sale. 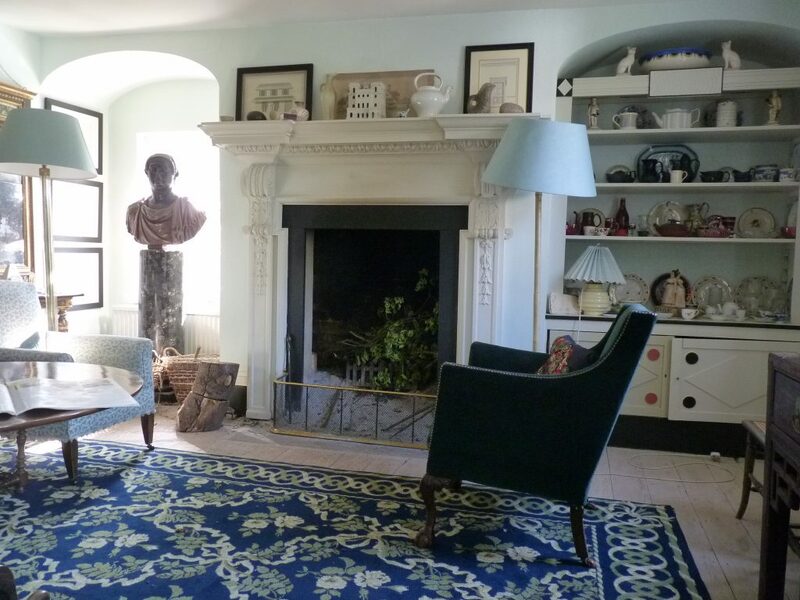 When I last visited in the late 1980s, the room was decommissioned, with a gaping hole in the ceiling; I could not have imagined how beautiful this room would look when it was finished. The art pottery and glass is Tricia’s, and the big pottery jug was fished out of the River Ouse when a lock was being drained there. 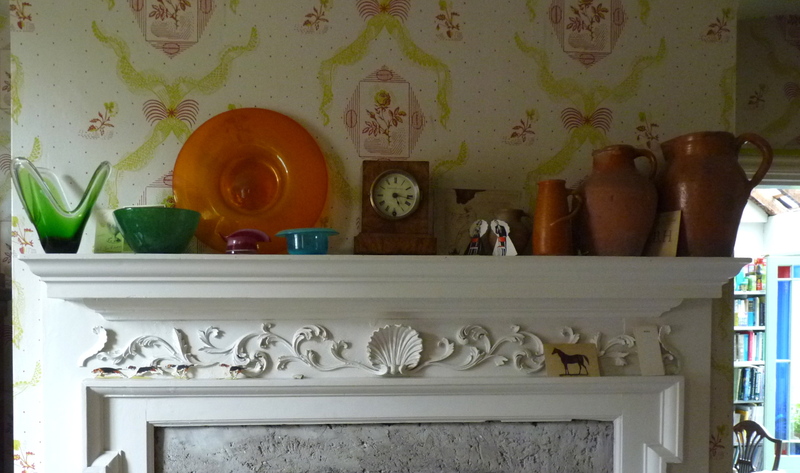 Tricia found the hand painted hound place-card holders that run along the chimmneypiece moulding, and she is waiting for her daughter Maud to paint some huntsmen and horses to run with them. You can see them a bit more clearly in the picture below. The small, enigmatic oil painting was a student work by their son, Arthur Hewlings. 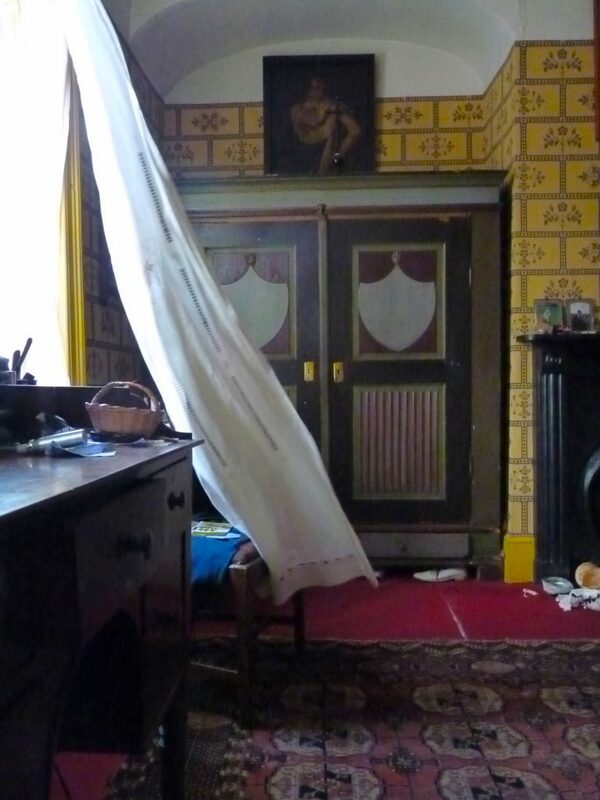 The bedroom, with poltergeist curtain activity. A sweet disorder. 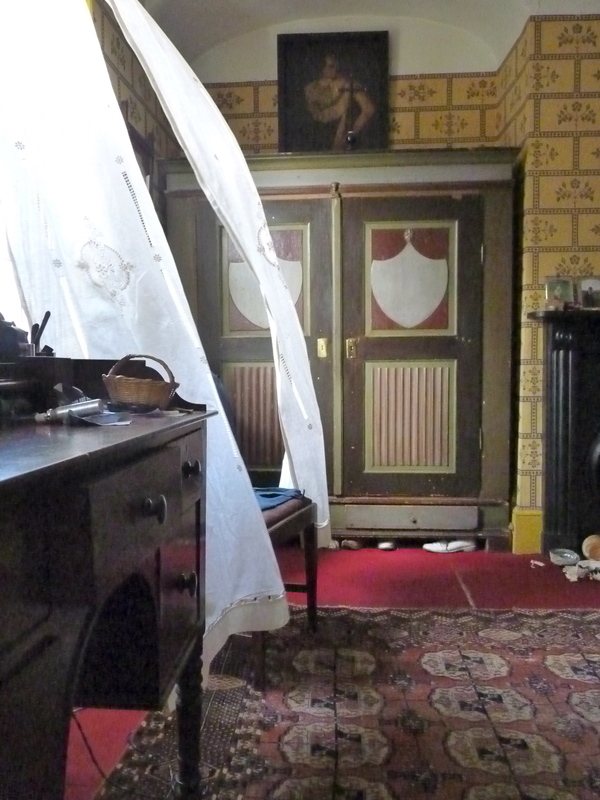 Shoes and shells lie distributed over the carpet, and wind-blown billets-doux flutter to the floor. Still life with upright vacuum cleaner. 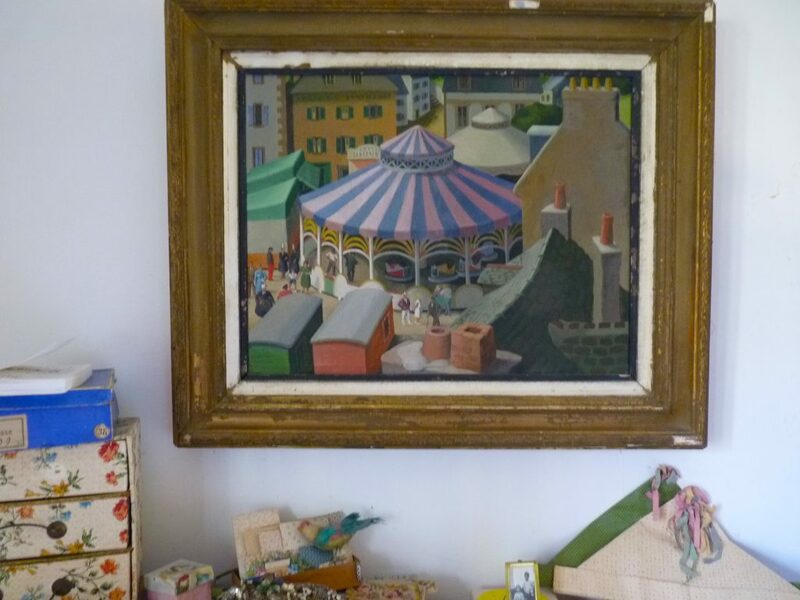 Bedroom picture, an early C20th fairground scene by Clodagh Sparrow. 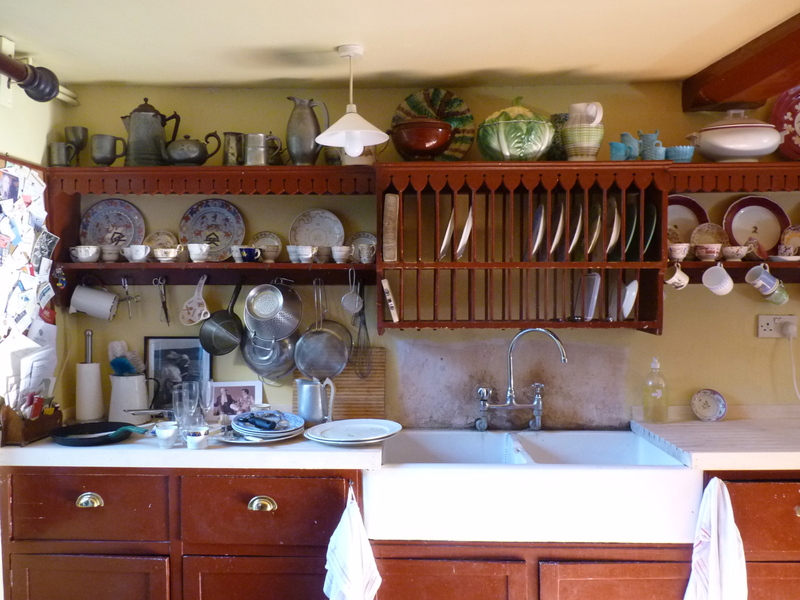 The much-admired kitchen, hand built, partly by Richard, with a new (in 2014) lead splash-back designed by Tricia. Better than Plain English. Saturday lunch in preparation. 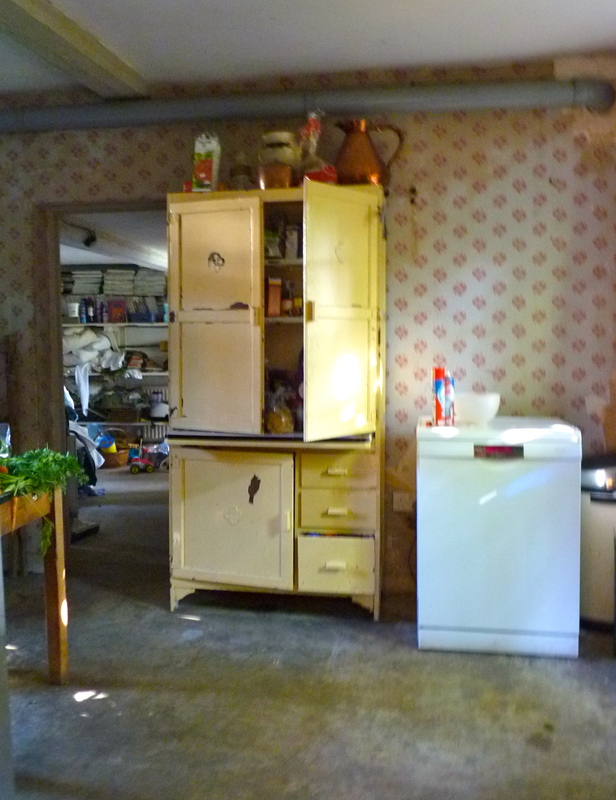 Not a museum, everything is for use, and in use. 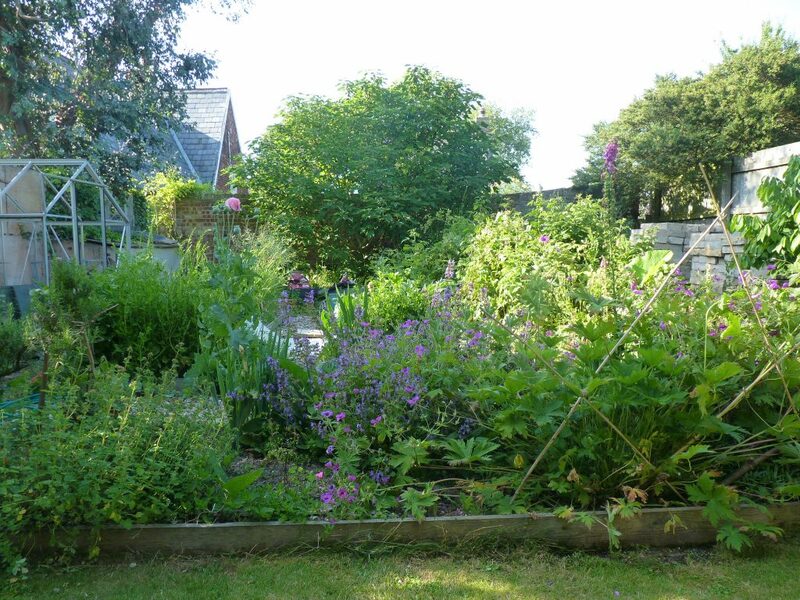 The lower garden, where food is grown. 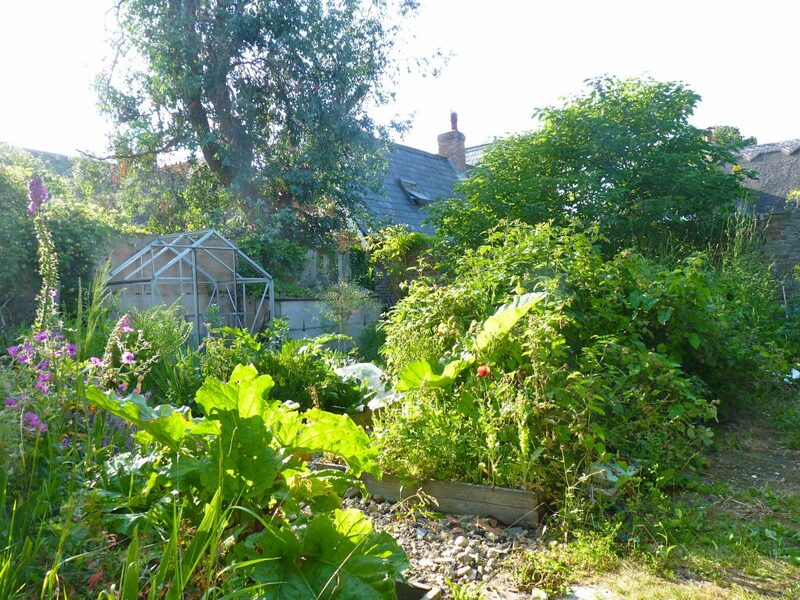 The land was reclaimed from beneath rafts of concrete which covered the farmyards here for fifty years. Arcadia. Compost heap and nature rampant. Now this article just makes me drool. I want to live lagniappe like this! Perhaps before I die. Beautiful all around. Thank you! 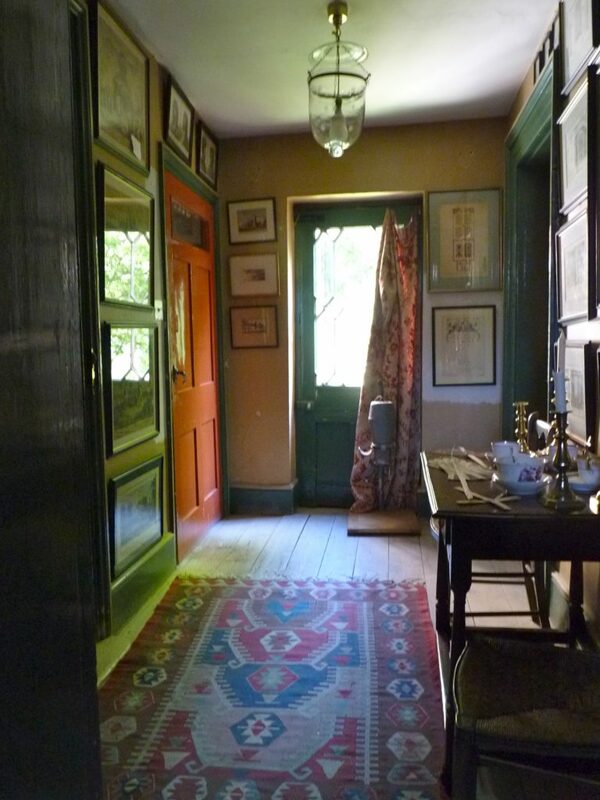 It is everything I have been wanting to look at regarding interiors. Thank you. 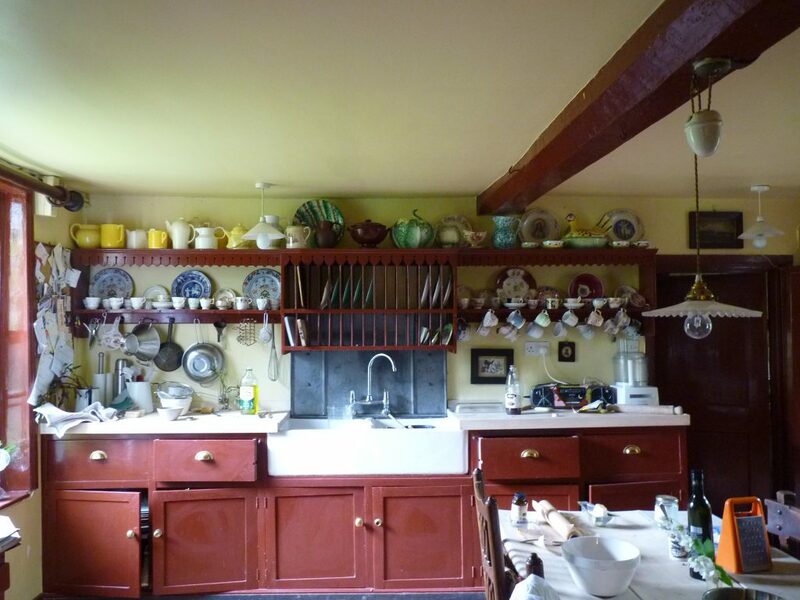 What a delightful post, Ruth, and such lovely informal photos of this interesting property. I love the vac standing to attention by a chest of drawers and I’m glad that I’m not the only one who doesn’t have a dedicated vacuum cupboard! 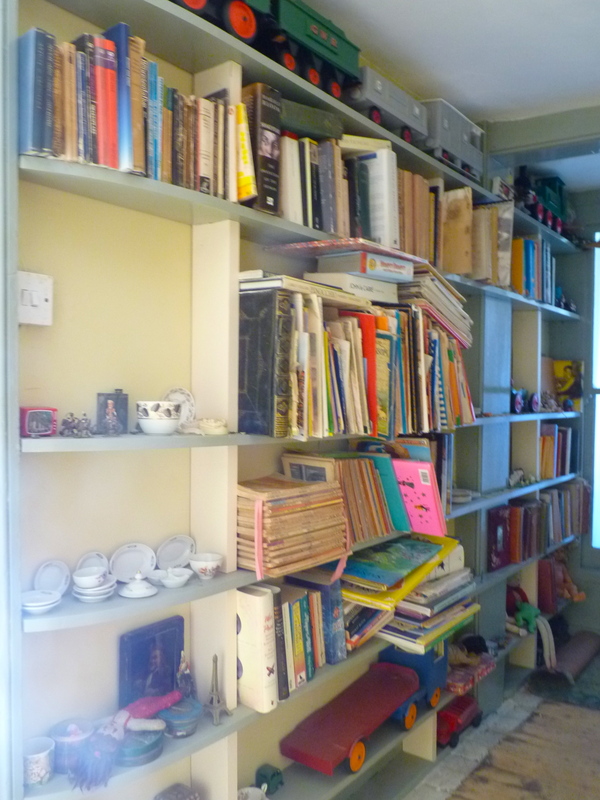 I love the casual disarray, a combination of grand house and homeliness. I especially love the kitchen with the new lead splash-back. I thought the last house was perfection…now this one comes along. I’m speechless!! Thank you! I was pondering the benefits of powder blue… Thank you for the ideas!! Really enjoyed my visit. A feast indeed. I look forward to re- visiting. Please, please email me if you are at all interested in selling the Clodagh Sparrow. 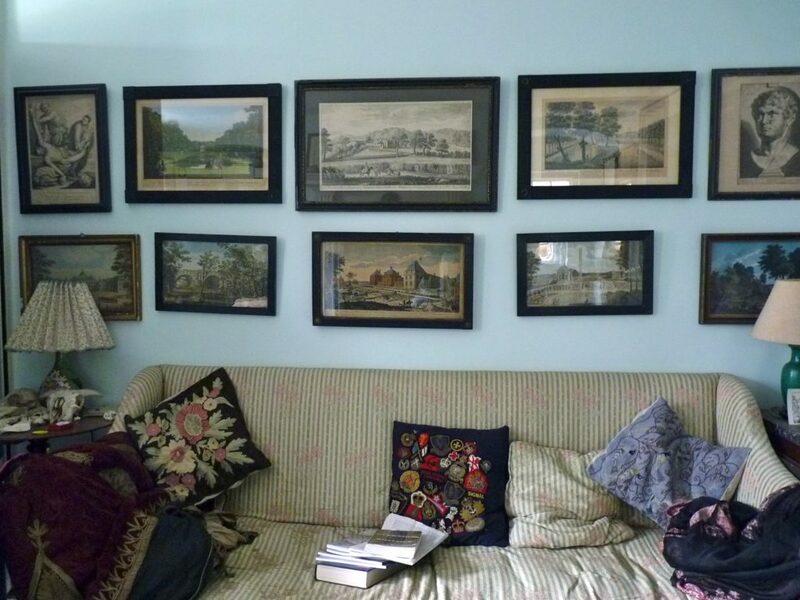 She was my aunt and I am collecting as much of her original work as I can find. Thank you for taking pictures of this lovely house! Wonderful. Glad to see you finished room. “Posh” indeed. Would be wonderful to hear back from you after all this time.